Word of the benefits of juicing fruits and veggies are all around the internet and I very much want to be part of the juicing community too. However, if like me, you can't afford a good juicer just yet, there is a cheaper alternative in the form of smoothies. For this one, you're blender becomes your best friend. 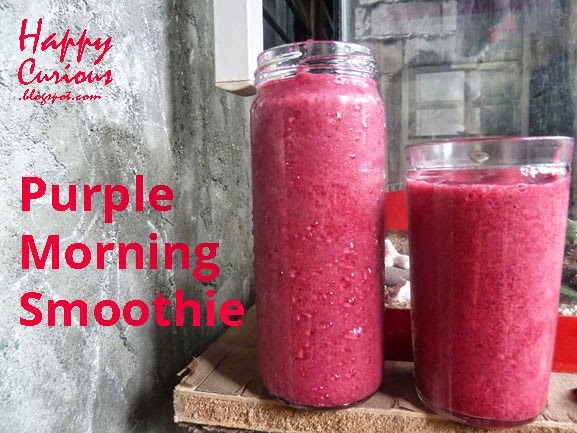 Here's a brightly colored and delicious smoothie to start your day! The original recipe is actually for a juice but I made mine a smoothie. I saw it on my Facebook news feed but it came from this page where you can read more about the benefits of this juice. All you need for this recipe are a carrot, an apple and a beet. Since the original recipe was for juicing, I modified it for making a smoothie. First, the recipe calls for the skins on so I got rid of the skins for blending. I also added 2 bananas to give the smoothie some sweetness. I tasted it with just the original trio of beets, carrots and apples and it was almost flavorless so the bananas made it sweeter and gave the smoothie a creamier texture. Another tip is to get yourself a high-power blender when doing this so you get smoothies that do have a very smooth texture. Also, pulse a couple of times first then blend for about 1-2 minutes to ensure a really creamy smoothie. I also wanted to add some milk. I didn't have any around so I had to make do with a half cup of water. It still tasted great but milk would have made it even better. A tall glass of this can be an alternative to a meal if you want to lose weight. This is also great as a post-exercise snack to give you more energy and detoxify you at the same time. I can promise you'll have happy tummies when you drink this -- at least me and my aunt did. So this would be a great drink to help with constipation and its delicious too so why not give it a try. Be sure to wash your hands and utensils right after making this because the beets make everything look bloody and leave your white containers and even your knife with a pink tinge. Also, beets are not common produce in the grocery stores so my aunt just grabbed a pack of 3's when she saw them on display. If you have no beets, just try this with carrots and apples and bananas (which I've tried by the way). It won't be a purple smoothie but it will still be healthy and delicious. You can make it a pinkish color though if you have purple grapes on hand. To make any smoothie extra healthy, you just need to add some leafy greens such as spinach, malunggay, camote tops or what have you. These basically make your smoothie darker in color but you can't even taste them as much as the fruits.